The Olde Mill Inn's club-like warmth comes from the elegant swoop of the the central staircase, overstuffed couches in front of the hearth, paintings of 18th c. hunting scenes on the walls, and sunlit bay windows. The warm glow of the Coppertop Bar and the house-made ale are no doubt part of the reason it's beloved by locals and guests of the inn alike. The complimentary breakfast (in the Conservatory) is generous: smokehouse bacon, home-made skillet coffee cake, the Inn's own granola, blintzes and mini quiches are just part of the spread. Grain House Restaurant (dating from the 18th c.) serves organic and sustainable food in a historic, wood-beamed room at lunch, dinner and Sunday brunch. In-room dining is also offered. Coppertop Pub serves pub fare and 12 brews on tap; be sure to try the house-made Coppertop Ale. From ballrooms to boardrooms, the Inn has beautiful rooms, catering and event services, and business services for meetings, weddings, or grandma's big birthday celebration. 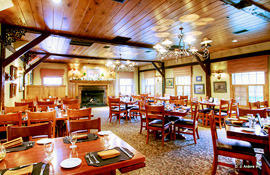 The Olde Mill Inn is in the Somerset Hills region of Somerset County and adjacent to Morris County, near Fortune 500 headquarters, golf and shopping. The town lies about 40 miles from New York City. Cancellations for stays arriving Sun-Thurs must be received by 4pm day of arrival, for stays arriving Fri & Sat, 24 hours prior to arrival.